Are you looking to have a retro themed Halloween party? I think it's a great idea! Sometimes finding decor items can be difficult. 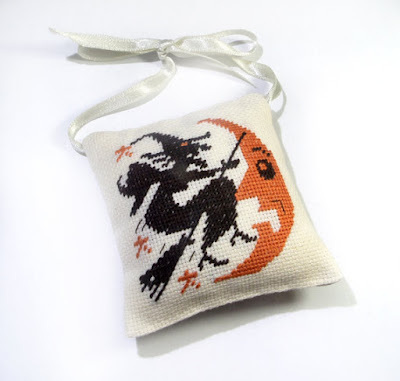 I'm so happy to show you these cross stitch Halloween ornaments and pillows on Etsy. They remind me of when I was a kid! Take a look! You all should know how much I love wicked witches! 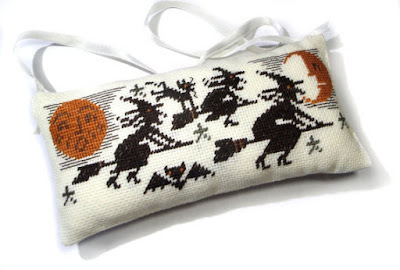 This evil witch broom pillow is such a great representation of Halloween night! I'm assuming that it is a full moon and crescent moon. I love the cat hanging from the witch's broom. This is very tame Halloween decor. The owl Halloween ornament is actually quite adorable. 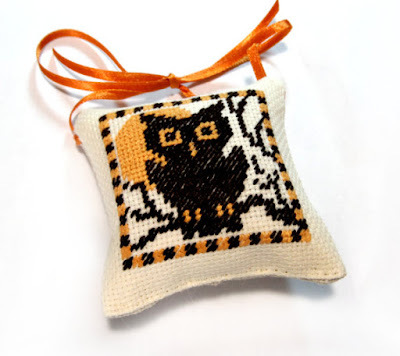 This would be a great gift to send on Halloween for some of your owl loving friends. I can visualize this witch cackling in the middle of the night. The scary witch ornament is going to set the Halloween mood. I wonder how this would look on a Halloween decorative tree! 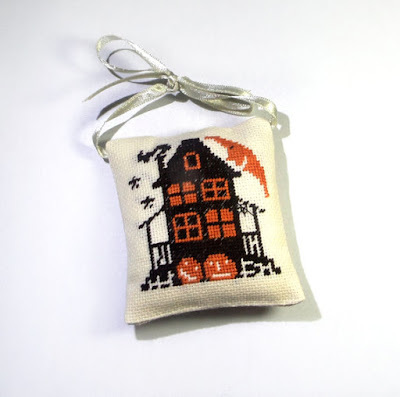 This haunted house decorative pin cushion is a little eerie. The moon looming above looks disturbing to me. What do you think? 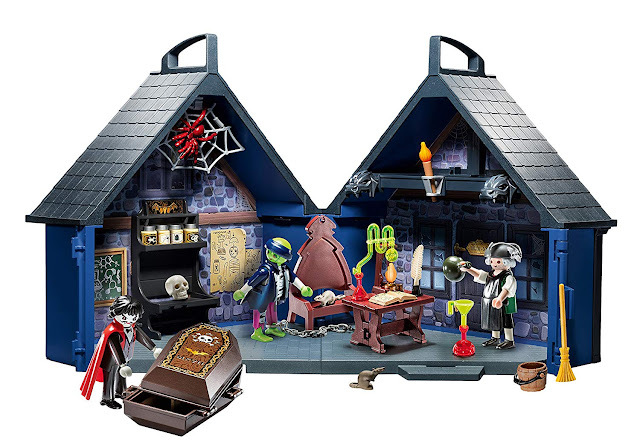 This is definitely a great way to make your home feel a little more ominous! Doesn't this look like old time London? 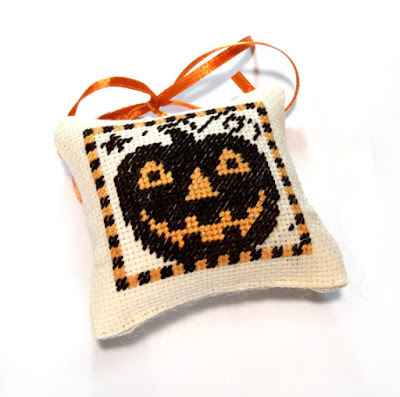 This Halloween pillow is kind of cute. I love how the crescent moon frames the scene, almost like a logo or a book cover. Even the moon is frightened by this witch! The moon's expression is absolutely priceless. 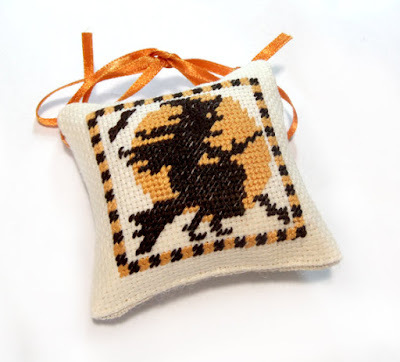 This Halloween decor ornament witch and moon pillow is perfect for the Halloween season. It takes a pretty common design and makes it one of a kind! This primitive cat decor terrifies me! There is something incredibly sinister about his devilish grin. The combination of that and his giant bow really freaks me out! 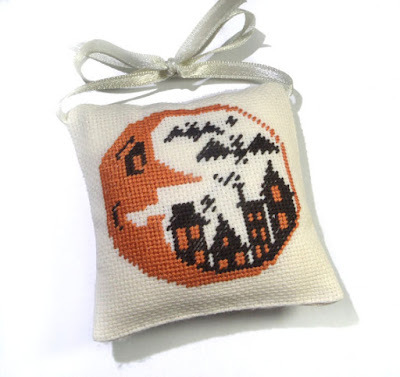 Now this Halloween pincushion is wonderful. 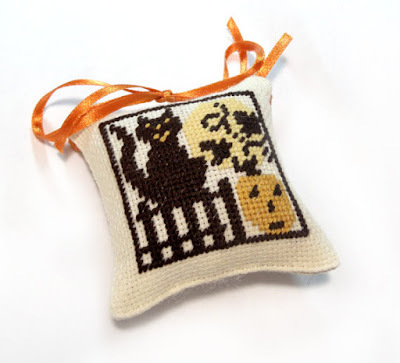 There are clearly Halloween themes in this cross stitch. I am just glad that the cat is innocently smiling rather than staring at your evilly. This pumpkin decorative pillow looks overjoyed. This is a great way to make your house more festive! This classic pumpkin has a very retro design, which I definitely appreciate. Halloween was scarier back in the day, in my opinion! 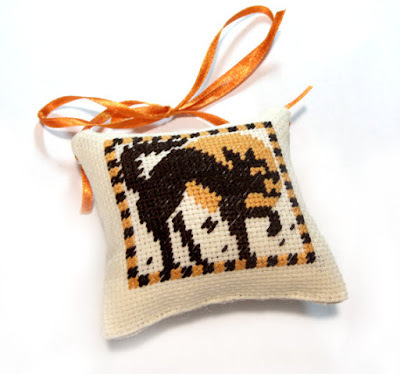 Now you can have this screaming cat pillow along with the screaming witch pillow. The dynamic duo are bound to really freak your guests out! 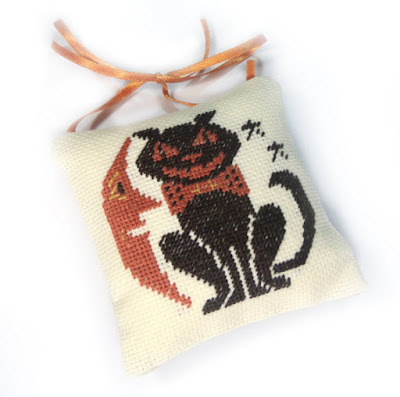 What do you think of these precious and spooky cross stitch Halloween ornaments and pillows on Etsy? 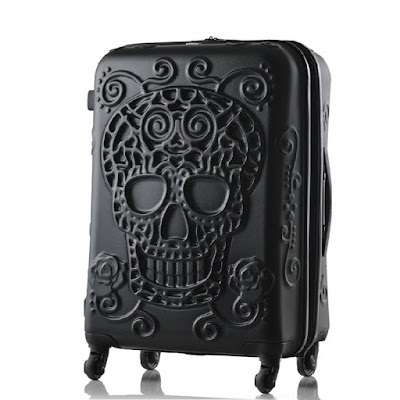 Some of the designs are so similar to things my grandmother used to decorate with. Comment below and tell me what you think of these fun ornaments!